Ranked in the top 400 universities world-wide in the Times Higher Education World University Rankings 2013-14, the exceptional student experience Liverpool John Moores University offers is founded on high quality teaching, ground-breaking research and dedicated staff throughout the university. The Centre for Innovation in Construction and Infrastructure Development (CICID) based at the Department of Civil Engineering of the University of Hong Kong, was established in November 2002. The aims include fostering continuous improvements, while targeting excellence in the construction industry in general and infrastructure development in particular, through the development of innovative strategies and techniques. BEPAM provides, a unique one-stop forum that publishes peer-reviewed research and innovative developments in both project management and asset / facilities management of building and civil engineering infrastructure. 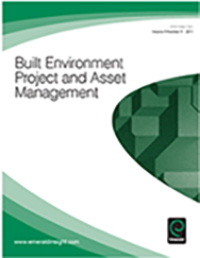 The journal also targets important interface issues between the planning, design and construction activities on the one hand, and the management of the resulting built assets / facilities on the other. Launched in 2011, BEPAM is well established internationally, e.g., being encouraged by CIB, recognised by the Australian Business Deans Council and indexed in SCOPUS, EBSCO, INSPEC and the Emerging Sources Citation Index (ESCI) of Thomas Reuters. Indian Institute of Technology Madras is one among the foremost institutes of national importance in higher technological education, basic and applied research. The institute has sixteen academic departments and a few advanced research centres in various disciplines of engineering and pure sciences, with nearly 100 laboratories organized in unique pattern of functioning. Western Sydney University is a world-class university with a growing international reach and reputation for academic excellence and impact-driven research. It is ranked amongst the top three percent of universities in the world, globally focused, research-led and committed to making a positive impact – at a regional, national and international level. It was established as a modern university in 1989 from its predecessors dating back to 1891. The WSU currently have over 40,000 students in a sprawling series of campuses across the Western Sydney region. The CSCT was established in 2008, with the motto ‘Sapientia et Doctrina’, which is Latin for Wisdom and Learning. It strives to create a learning environment to nurture the development of critical thinking skills; support innovation; and develop knowledge and expertise of our students. CSCT faculty have expertise in a broad range of specialties and have developed curriculums in each of the programs that meet the needs of the construction industry.